Week 62. Bucaramanga to Soata. Biking in Colombia. – Spinning South. Week 62. Bucaramanga to Soata. Biking in Colombia. 12th till 18th of August 2018. If you know that Bucaramanga is the capital and largest city of Santander in Colombia with almost 522,000 inhabitants, you can imagine that we are lucky to have MapsMe which works offline as a route planner to guide us out of the crazy busy city. We first try the bike route but this is taking us way too much into the suburbs and on a detour and after hesitating but seeing quite some local bikers taking the bypass (highway), which is not allowed for bikers, we decide to follow. One of the weekend hobbies of Colombians is flying kites which are sold along the road out of town. Then, for the first time we see Venezuelan refugees walking along the road. We have seen people begging in the bigger cities but not walking along roads. Seeing them run away from their home country with only a few belongings, whole families with small kids is upsetting. 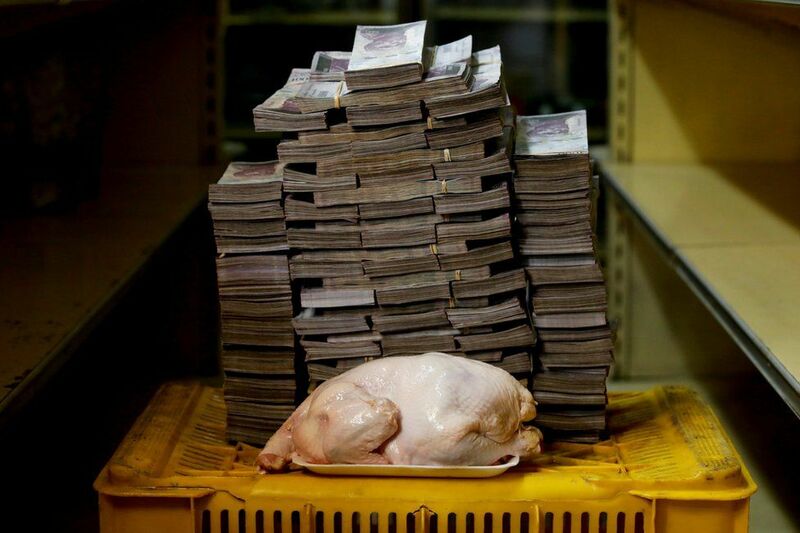 Venezuelan economy is in free-fall and inflation has reached 83,000% (eighty-three thousand). Prices are doubling every 26 days and many people are struggling to pay for basic needs as food. Core of the problem is their sole dependency on oil exports. Here is an example of the money to need to bring to buy food. It is putting quite some pressure on the Colombian society, but they try to support them as much as possible. Here food and water is provided along the road. They tell us they see up to 300 people per day only on this stretch leaving Bucaramanga. Those are the ones who leave the city, many must be hanging around in the city too. Along the road we also are passed by a lot of bikers as it is Sunday and Colombia is not only know for kiting but also for biking and they love to hear our story. This week we also enter a total different area. Where our legs were spoiled with the Magdalena Delta, easily covering 40 km in a morning, we are now heading to the canyons and mountains. Out of Bucaramanga we need to follow a winding, small road which is also the main connecting road between Bucaramanga and Bogota. Only luck we have is that it is Sunday and only a few trucks speed by. After the climb out of the city we enter the dry, desert like Chicamocha valley and decide to stay at the bottom even if we only did a meager 45 km. Nice to have some time to work on the blog. Good thing we did not go up the same day as the next day we are welcomed in the morning with a climb from 300 to 2000 m in bit over 20 km. No pushing but steady uphill with traffic but an amazing landscape and totally different vegetation than last week. Starting from the rough, fast flowing Chicamocha river. What is always surprising us is the altitude you can gain within a reasonable time, how you not only see the change when climbing out a canyon, but also feel the difference in wind and temperature. When we are lunching along the road a car stops to give us water but also an address for a new hostel in San Gil. Bizarre to see a water amusement park in this very dry landscape. Once we cross the rim go down the other side, the landscape is suddenly greener than green with coffee, tobacco and old man’s beard (moss) draped on the tree as if a decorator was not interested and wanted to do a quick job. Did you know this has very good anti bacterial qualities? Maybe stupid to bike into the very steep streets of San Gil, but it was nice to check it out and stay in the newly opened hostel of Alejandro, in a 200 year old colonial building. I should have checked next day’s route better, as we have to bike out of the city to a crossing we passed the day before, but each disadvantage has an advantage (Johan Cruijff), as we had the best pizza in a very long time in San Gil. Biking to Mogotes brings us again from 1000 to 1800 meters on a very quiet asphalt road, winding between coffee plantations. Very interesting day as around the corner we see a plant producing panela, sugar cane sugar. Sugarcane is cut by hand without first burning it as is often done to remove the sharp leaves and scare snakes away. Manly transported on mules or trucks to local factories or still being produced at home. It is estimated that in Colombia 350,000 families produce panela. We are lucky to be allowed to watch the production. Squeezing the cane results in sugarcane water, particles first settle, sugar-water is heated, filtered, heated, and filtered again. All by hand without any protection gear. Once it reaches 120 degrees and has boiled until it has the right thickness it is transported to the “clean room” where it is cooled down and poured into blocks. Entering Mogotes over the bridge it steals our hearts straight away. We choose to stay in the colonial hotel, nothing fancy, bed with cold shower, but with old staircase and inner court. As we have been climbing so much and need to climb more, we allow ourselves a rest day. Writing, blogging, resting, wandering around town and getting bitten by small black flies. Biking to Onzaga is for the first time dirt road. Hot, humid and hilly with almost no traffic. But first breakfast in the best Panaderia (bakery) we have had in a very long time. Great Aqua de Panela with cheese. Yes warm water with sugar cane sugar and a piece of white cheese which you drop in the hot water. Nice bread for breakfast and cookies for the road. Winding through farmland with lulo (yes Dutch friends; 1 l) fruit, sugar cane and cows. Stocking up with water in San Joaquin immediately creates a group of people wanting to know what all the flags on Franks bike mean. And of course we get the usual questions of: how much does it cost to travel so long, how expensive is the bike, how much longer will you travel. Trying to find answers without revealing everything. Later, down the road, we have a long chat with Pedro, an ex physics teacher who offers us platanos. Platanos are the bigger brother of bananas with more fibers and most of the time used to cook or deep fry. We never thought of eating them raw, but you can, if they are super ripe. The place I wanted to stay is closed but are happy to find a place with shared bathrooms, cold showers. We are now at 2,000 meter and cold is really cold. We eat at the most bizarre setting so far. In the kitchen of the restaurant. Only serving one dish. Meat, rice, potato, yucca and fried platano. Nice chat with the owner Inez who is 70+ and still running the place, offering breakfast from 5:30 in the morning, lunch and dinner till 20:00. What a hard worker doing all of this with only 4 people in total, serving 40+ meals in the evening. We are now following the Oh Boyaca bike packing route of 604 km, which has a difficulty level of 5 on a scale of 10. Next day’s ride to Soata makes us wonder if we should ever choose for more challenging than 5, but is amazingly remote and quiet. After some kilometers so steep we need to stop every 30-50 pedal strokes to get our heart beat again on track. Bummer I can’t sit on my saddle to start again (feet can’t touch the ground), which is asking even more coordination and effort. Of course at one moment I am getting tired and slip from my spike pedals and hurt my shin. For the first time I cry out loud that I want to be back home. 500 m uphill, 400 m down and 900 m up again. Changing from farmland, to eucalyptus and pine trees, from jungle to sparse vegetation. Looks flat but is a +6% incline at almost 3,000 m. But so remote and beautiful that the pain, lack of oxygen and struggle is quickly forgotten once we reach the highest point at 16:30 and are totally spent. Would love to do this without luggage, arrange transport to bring your luggage from one point to the other. We see only one motor bike and one truck during the whole day. The ride downhill is mega adrenaline kick, steep with back brakes which are almost worn out, thunder clouds and a rainbow with Soatá nested in the valley of the Chicamocha river. We stay at the main square as this is one of the few places with warm water and we don’t want to go look around. From a small balcony we are able to watch the street life. Saturday is again a rest day as we want to get used to altitude, town is located at 2,000 m. Frank has no issues, I only have minor heart palpitations at night and a slight headache which is solved with paracetamol. We find Fique fiber with which I want to try to make crochet something. Lovely chat with the owner of the fabric store who explains that the fiber is made by hand and spun similar to how my mother would spin wool. Only bummer is that WIFI in the hotel is not working so Frank & I change places in the coffee shop across the square to work on the blog and drink coffee. Saturday night is the worst night ever as the discotheque across the square parties until 3 in the morning. But that is story for next week. Will we continue the bikepacking route? Was het wel suiker? Geen cocaïne wat ze aan het maken waren? Want het proces lijkt er wel serieus op🤔😂😂😂😂. En zo’n serieuze Frank. Amai. Beautiful photos! Be well Frank and Jacinta. Previous Post Week 61. Mompox to Bucaramanga. Biking in Colombia. Next Post Week 63. Soata to Chita. Biking in Colombia.